Sushi is vinegared rice that has been topped with other ingredients. Making sushi at home is not only much cheaper than buying at a restaurant, but also very easy and fun. This is one thing you’ll enjoy doing during the weekend, maybe as a form of bonding exercise with family or friends. You can customize your homemade sushi to suit your preferred taste. Try some of this sushi recipes and add your desired home salad. One of the easy recipes is cauliflower rice and quinoa sushi. This recipe is best when you’re trying to avoid heavy starch. 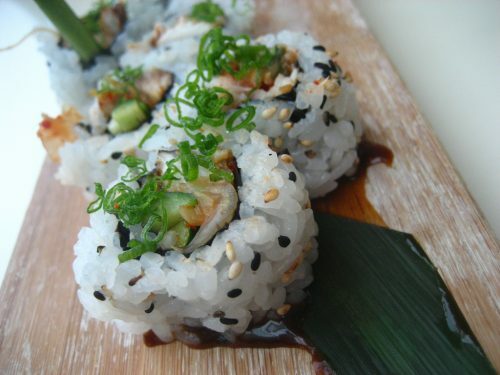 In this type of sushi, you use quinoa and cauliflower rice in place of white rice. You can choose to use carrots, cucumber, and red peppers to make your sushi more appealing. An avocado would also help in adding little healthy fats. The other sushi recipe that you can make at home is the crunchy avocado hand roll made from brown-rice cereal. This is going to make you feel extra adventurous. Well, I must admit that it’s hard to make perfect sushi cones, but you got to try this. You can use shredded coconut to lighten up the crunch. Spicy tuna roll is another sushi option that allows a variety of spices and easily made at home. This is a perfect idea for people who raw tuna fish is never a good idea. Try spicing it up with some Sriracha and chili oil. Sriracha mayo can also give you an amazing sushi experience. Asparagus roll is another amazing sushi idea that you can make at home with only one ingredient in the roll and the rest is readily available in supermarkets. The ingredients include; seasoned sushi rice, 3-6 raw pieces of asparagus, Nori sheets and a bowl of water. Japanese bagel roll is a sushi recipe with simple ingredients although there are a number of variations among sushi bars. This type of sushi is fairly popular in the United States. Feel free to put any of the following ingredients in your roll; sushi rice, well-sliced scallions, smoked salmon, cream cheese, cucumber, and roasted seaweed. You can also use asparagus or avocado in place of cucumber. Spicy crab sushi roll can also be easily made at home. This is a very good recipe for rolling beginners. This sushi recipe is key to developing rolling techniques because of its simplicity, helping the learner focus more on the rolling. It is a perfect recipe to start with if you are new to rolling. Add spicy mayo if you want to add some heat or eel sauce for a slightly sweet taste to your sushi. So what’s stopping you from making your sushi at home? Double the fun in those girl moments by transforming them into sushi making moments. If you make sushi at home you end up with 5 or 6 sushi dinners for a cost of just one at a restaurant. Save those $30 you would otherwise be charged at a restaurant for just a few sushi rolls. I know there are other rolls that you can easily make at home, let me know what you guys come up with. Copyright SakaeSushiKC.com 2018. All Rights Reserved.